Montecito at RidgeGate in Lone Tree was planning on new patio homes. UPDATE: See comment below about the change in plans. 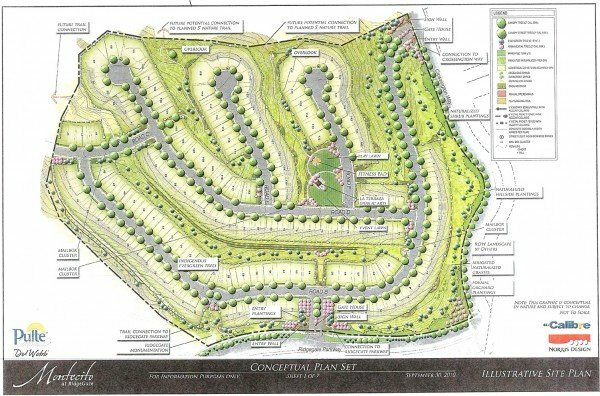 Century Communities now will build single family homes instead. Last week, I was excited to meet with the management of Pulte Homes to discuss a new project they are planning at RidgeGate Town Center and Lone Tree. I was excited because they will be offering brand-new, upscale patio homes at an extraordinary price point for the area. The community will be called Montecito at RidgeGate and will begin breaking ground by June. Some 140, low maintenance patio homes will be available for sale by the fall. The Pulte management team shared the architectural designs and the plat map with me and a few colleagues. We had lunch in the Kentwood Company conference room on Thursday while we reviewed the exterior elevations, site map and artist’s renderings of the community. The elevations included Spanish colonial and Mediterranean eclectic. We also discussed floor plans and made suggestions about outdoor spaces such as balconies and patios and possible even a courtyard. Inside, I was surprised to see an unusual level of standard finishes being proposed. Items like slab granite kitchen countertops and stainless steel appliances that are upgrades for most builders are being considered as standard for these homes. With a starting point near $400,000, faulty expects to be able to deliver homes in the $450,000-$550,000 price range even after all selections have been made and life premiums are considered. That will be a revolutionary price point for the area. Resale patio homes at The Enclave In Heritage Hills are selling now in the $600,000 range. And, Celebrity Homes is offering a gorgeous semi-custom home with prices starting near $800,000. All of these Montecito at Ridge Gate patio homes will back to some form of Greenbelt offering a more spacious feeling than usually found in low-maintenance cluster homes. Some will have view and some will offer walk-out basements. Proposed Montecito site map in Lone Tree. Double click to see enlarged map. There will be a small community Park called La Terraza which will build on the Mediterranean theme and offer an alfresco or open air gathering and entertaining place. Seating will be protected from the elements with a rustic tiles structure and an outdoor kitchen area. There will even be a Spanish/Mediterranean style water feature. The architect, Norris Design, envisions that the park will take advantage both of the outward view of the countryside and to be seen as a visually appealing prominent focal feature for the community. They see it as a work of public art. Montecito at Ridge Gate will be able to take advantage of all the amenities that are currently located in Ridge gate as well as those that are planned in the near future. It will be adjacent to the Sky Ridge Hospital and near the South Suburban Recreation Center. This fall the Center for the Performing Arts will open nearby. The community also offers easy access to the light rail for transportation into downtown Denver. As a Realtor who lives in the area, I’m excited to see this new concept come to RidgeGate. My suspicion is that these homes will sell quickly once they’re offered on the market. Pulte Homes promised to keep me informed as to any new developments and also let us know when the first reservations for sales will be offered. If you have any interest in this product please let me know now so that I can be informing you as the project moves forward. Just use the form below and I’ll be happy to keep you on my interests list. This looks really nice. Affordable means different things in different areas, but Pulte does a great job. I have sold several of their homes here in Northern California and my clients have are very happy with their product. Interested in these homes, please send floor plans when available. I have a house to sell. Interested also in these homes , please send floor plans and lot size when available. UPDATE: Montecito has now sold out all 142 single family homes at prices ranging from $600,000-$1m. Resales there are now selling for slightly more than that. Too bad. It would have been a terrific patio home community.